COLUMBUS — All four Northmor wrestlers remain alive after the first day of competition in the 81st State Wrestling Individual Tournament at the Schottenstein Center in Columbus. Gavin Ramos, Aaron Kitts, Conan Becker and Conor Becker all remain in contention spots on the medal podiums. Wrestling continued Wednesday morning for Northmor. The Inquirer will provide updates as we receive them. Follow along over on our Twitter @GalionSportsGuy for updates. Conan Becker, Ramos and Kitts are still in the hunt for championships. Conor Becker lost his first-round match, but remains alive in the consolation bracket and could finish as high as third. First on the mat for the Golden Knights was Ramos in the 126-pound weight class. He finished fourth in the Heath District tournament and was paired up against Brooklyn junior Seth Majewski, the district at Garfield Heights. It may have taken all three periods but Ramos would advance to see a second round in the Championship Bracket, defeating Majewski via a 5-2 decision. Kitts, representing Northmor in the 132-pound weight class, was in action at the same time as Ramos, against Oak Harbor junior Tad Jensen, the second-place finisher at Defiance. Kitts, who was the third-place finisher at Heath, won a 10-1 major decision. Conan Becker, at 145 pounds, faced the fourth-place finisher from the Garfield Heights District after he won the Heath District. Becker had little problem witt Mapleton junior Beau Lefever, winning via technical fall, 6-1. The only Northmor grappler to fall in his opening-round pairing was sophomore Conor Becker. Becker met up with Ashtabula St. John School sophomore David Cumberledge. The two wrestlers battled it out until the end of the match, bit it was Cumberledge advancing in the Championship Bracket via a 10-8 decision. In the consolation bracket met up with Covington junior Keringten Martin. Martin lost his first match 3-1to Chase Moore of Swanton. Conor ended Moore’s tournament by defeated him 8-5. 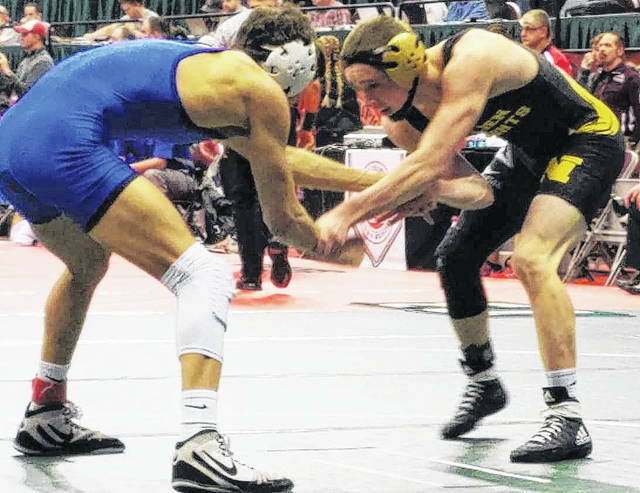 Pm Friday, Becker was slated to wrestle the winner of a match between Xenia Legacy Christian Academy’s Dillon Walker and Newark Catholic’s Billy Luft. Ramos vs. Jamestown Greeneview junior Devan Hendricks. The winner will get the winner of Swanton’s Trevor Schaller and Johnstown Northridge’s Klay Reeves. The defeated wrestler will move to the consolation bracket and face Acranum’s Ethin Hoffman. Kitts vs. Rootstown junior Niko Chilson. The winner will get the winner of Mohawk’s Daniel Price and Troy Christian’s Jacob Edwards. The defeated wrestler will move to the consolation bracket and face New Paris National Trail’s Peyton Lane. Conan Becker vs. Ada senior Chase Sumner. The winner will get the winner of Garrettsville Garfield’s Logan Kissell and Gibsonburg’s Hugo Villarreal. The defeated wrestler will move to the consolation bracket and face Rossford’s Austin Eick. 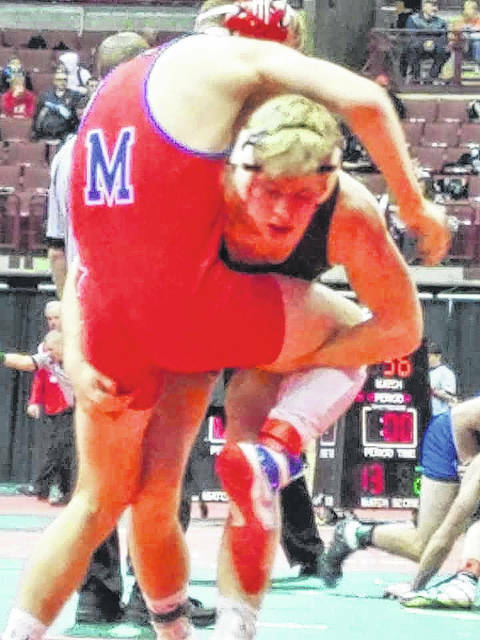 Northmor’s Conan Becker kept his state title hopes alive by winning his opening-round match against Beau Lefever (in red from Mapleton) on Thursday via technical fall; 16-1. Gavin Ramos, Northmor Golden Knights representative in the 126-pound weight class won his first match on Thursday to keep his championship run alive. Ramos defeated Seth Majewski of Brooklyn via a 5-2 decision to advance.